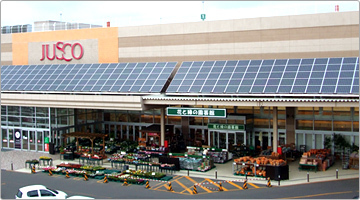 Aeon Retail Co., a major Japanese supermarket chain, announced August 28, 2012, the launch of its "Eco Project" starting September 1, 2012. Through this project, Aeon intends to meet the growing demand for energy and power saving while dealing with projected chronic power shortages, using three strategies to achieve a sustainable society: "reduction," "generation," and "protection." First, Aeon set a target to reduce energy use by 50 percent by fiscal 2020 compared to its 2010 consumption, by introducing energy-saving facilities in its stores, developing new next-generation eco-friendly stores, and developing the needed human resources to support the project. For generation, Aeon expects to install renewable energy generators, primarily photovoltaics, with a generating capacity up to 200,000 kilowatts -- taking advantage of its sites with more than 10 million square meters of area -- which is enough to supply power to 45,000 households annually. Under its protection strategy, the company has already concluded agreements on disaster prevention with local governments in about 680 locations to provide support in times of emergency and installed 28 large emergency tents, most at its bigger stores. In addition, it intends to promote the installation of private electric generators other than renewable energy generators at 100 stores to enable them to continue business and provide merchandise to customers in emergencies.